Ok, I went in expecting the usual tropes of an “I’m in an otome game and I’m the villain!” story. Sure, the description had a nice hook: all the ‘capturable’ male targets have ridiculous traits, leading me to believe the comedy will derive from the MC in handling their idiosyncrasies. Yes, some of it remains, but the story goes much further than that. In fact, the story development has veered considerably from the initial premise. The earlier chapters were fluffy, light and comedic as the MC starts encountering... more>> the game characters in this world. Characters were introduced, their background in the game made known and the MC immediately sets out to ‘correct’ their flaws, nip potential troubles in the bud and avoid triggering the death flags that would befall on her as the game’s rival to the yet to be revealed heroine character. The characters started off retaining their identities as per the game, but with the MC's nudging and influencing events from before the game's starting point, the characters have changed considerably. "What made this guy twisted? Ok, let's prevent that from happening. Look, now he's a totally different person... wait, is this a good thing or a bad thing?" We can see the author’s writing improve in the later chapters. Indeed, the chapters get longer and longer as plots, character development and events far beyond the scope of an otome game are narrated in detail. The characters slowly outgrow the initial stereotypes the MC had played with, giving her much to think about as she tries to come to terms with her status as a princess of a medieval kingdom, surrounded by threats of war and destruction. And a demon lord reincarnation. It is humorous to read about the MC’s rants about the game’s failings, and her crush on an older person who was just a support character in the original game is cute. The MC’s own characterization grew deeply as the story took on a darker turn as she realizes her position, her ability to influence future events and yet powerless to take action directly. it becomes irrelevant, I think, in the later chapters when the last dude to be captured appears. I'm still unclear on what the situation is too. The MC is so good, she is almost like a messiah saving everything and everyone in sight. Which is fine, except that the MC apologises for almost every. Single. Thing. This is pretty good. I think it's interesting and the characters are likable. It's a fast-paced plot. All the characters seem to change, which provides for suspense. Despite knowing the otome game well, it seems that the FL reaches a point where she has no idea what will happen. The thing that I that I am most uncomfortable with are the heavy undertones of lolicon... I think that with most of the events, the FL could be older. It's age progression but the characters that she spends the most time with... more>> are all like way older than her (and the characters that she seems to like the most), and though it's respectable that they treat her with respect rather than patronize her... for some reason it's actually weirder that they all take her SO seriously? I think there should be a lolicon tag. In fact it got to the point that I couldn't continue just because I can't get over the lolicon undertones. ALSO what someone else mentioned - she doesn't have any female friends? I recommend if you like cute and sweet novels like this one here, although it's not all very sweet type. There are scenarios that produce sugar that causes diabetes. I didn't like harem stories so much but this is one great reverse harem with pairing (?) story with a cute MC. The story was typical at first but it starts to be way more interesting after a few chapters. The main plot line of the novel was nicely done. Some characters' personality had been portrayed well. This a cute, generic, reborn-into-an-otome-game-as-the-mc's-rival story. This is perfect for anyone looking for the same type of storyline. I love the characters and the writing is well done. The MC isn't dense to a point of annoyance, and her sort-of calm character is refreshing. All in all, a solid shoujo novel that should be well liked by most who read it. It's nice that we can see chapters from the other characters' povs as well. from all of otome game reincarnation novel I've read, this one has the best plot and proper reverse harem usually found in novel. The author didn't (or haven't because the novel wasn't completed yet) force the character to became a couple. Typical plot otome genre, slow paced, BUT some characters may really draw you in. For me it was Rosemarie and her Father. No, Rosemarie and the King. Rosemarie and His Majesty' scenes are where I get the urge to put some dark and mysterious dark fantasy ost. Could Dobby ost fit? Maybe Library of Secret? I wonder. If it was an anime, it must be animated by shaft. Revolving random object, Rosemarie's glare, books, King's hand turning book pages, in silent. No words exchanged for some duration. It feels magical as if... more>> Rosemarie's anger or anxious or fear or whatever emotion it is, are screaming to you. 2. The novel is true incarnation of women. Almost all of the earlier chapter are all rants. Yes, rants. Like your wife, or your ex, or noisy neighbour, or angry costumer, ranting at you to express their rage, or mocking others, no holding back. It's either you come to really hate it or love it. Oddly I feel entertained, even if I am a man, as if I was Rosemarie's ally, embracing her, plus the fact that the targets of mocking are truly detestable. 3. Rosemarie's character is cute but elegant. Easy to blush but strong. Anxious but determined. Her slightly angry pouting LN illustration is super cute. It's the weird feeling of some characters age gap. It looks like lolicon but actually it's not even the slightest bit. The MC is really likeable. Even though she said once or twice that she uses her knowledge of the game only to avoid bad things happening to her, she's actually really kind and try her hardest to help the characters of the game and even everyone in the kingdom. The writing, flow and story development is top-notch. It was highly immersive and I was entranced. In fact, I finished 102 chapters in one go and am continuing to read the raws. The story focuses on the protagonist's current life and her position unlike other stories where the protagonists heavily rely on past knowledge or emphasis on the crushing of these flags. It might be slow-paced for some but the content lends itself to the intricate world-building through these fine details. The protagonist is no Mary-Sue and understands her responsibility... more>> of being born as a princess. In fact, she is painfully aware of her limitations and has an almost inferiority complex. She constantly reviews her actions and does not acknowledge herself which is very relatable especially since every action potentially brings about huge repercussion that may spiral out of her control due to her position. I also appreciated the different povs the author wrote which allows us to understand where each characters are coming from. I don't understand how it has such a high rating. The premise is the same reincarnated person into the body of a future villainess ojou-sama. But frankly, the flow of the story is just too disappointing. First, what disturbed me the most is the MC's TOO YOUNG age, seriously, the author is terribly stingy for the MC's age. It's just plain creepy. The characters are also tad too much dramatic. I gave up reading it after chapter 50 or so... Just... plain disturbing. At the very base and the shortest thing I could say is that it's a good story that would pass time but it's nothing earth shattering. The main character is reasonably likable and at times she's incredible, however at the end of this I never truly fell in love with her like some of the other characters I've read. Does she stand up against the other otome protagonists? Not particularly, for better or for worse she feels a bit standard, although her love target is abnormal. The side characters are well... more>> written, with my personal favorites being Theo and lutz. However the romance between georg, Kraust and johan are shallow, and barely have anyspotlight before suddenly, the guys are in love with the MC. Plot wise, the story is similar to many (don't die/get a death flag) but turn up the political intrigue and turn down the obliviousness and give her an actual love target, you now have Rosemarie. It's not like Rosemarie isn't a solid character on her own, however I think how much you like her stands on how many stories/protagonists have you seen/read before getting to this one. There is less humor and more plot in Tensei Oujo, which does help move things along, but hinders some of the character development. I really liked this novel so I am writing a review. Even so the world is a game, I think the people are real. The MC is not the best. All she did was from her heart so it was effective. The ML (the one I think is the ml) is not madly in love with her. It's not like the other otome world novel I read thst MC has overly doting parents and siblings. Somehow she is alone (that's how she thinks) it's sad. But I like how it's a... more>> fantasy world, not a world with fantastic people. Well I think I said too much. I just want to say it's a really good novel that I liked. Oh! And THANK YOU AUTHOR! The story is amazing. 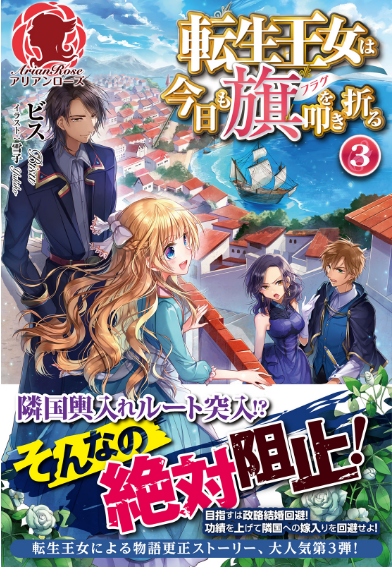 Unlike other otome game reincarnation novel, this novel felt realistic and make more sense. I will admit, I had expectations... and the author definitely overachieved. Unlike other reincarnation otome games, the heroine and princess of this story, Marie is moderately cute. It not like its so sweet it'll make you gape at the "wondrous" description, in fact I teared, grieved, smiled like a goof, and had verbal outbursts because of this novel. I may be over-exaggerating but the realistic plot is just that good. in fact it's only later in the story where the situation pressed for it that she reveals some of it... and sadly she doesn't want to rely on the dependable people around her. She also tell white lies that shows off the fact she isn't dependent on her knowledge. Aside from the fact she's a princess pressed with responsibility, she still is a relateable character when it comes to divulging her secret. The characters surrounding her are as captivating, charming, and sometimes humorous as Marie's character. The summary leads you on thinking Marie would have done her absolute best to avoid and try to resolve those flags, but she doesn't! I means Marie doesn't go so far out that it loses it realism, in fact some the exaggerated the terrible characters of the original otome game were caused by simple but believable situations. The Commander of the Royal Knights mentioned is also not overbearing, not a "puppy-dog" and the growing evolution of there relationship is well paced. Also the terrible love interests in the otome game, are truly terrible. The summary lives to its name... there history and the reason behind there characters are acceptable. The side supporting characters are loveable as mentioned... hah... its better the read to story to find out what happens to these characters. And mind you, Marie reincarnates as a young child before the turning point for the love interests ever happened, the "terrible" persona's of love intrests don't come into play as far as I know. 1. The comedy it pulled out in the beginning to entice readers. 2. The fluff that came with it. 4. The first WN that made me think that you really don't need to put OP or too much modern knowledge in order to make you enjoy the an isekai/ fantasy plot. Development in the end is important. Gave it a 4.5 cause of how short the chapters were and how I feel that the otber characters just end up disappearing along the way.